Nebraska was up 23 to 0 at half time vs Tennessee at Chattanooga in the season opener, so we decided to hit a winery that Ted and Shannon had discovered a couple of weeks before at the Scotts Valley Wine Walk. An hour later and 20 degrees cooler we had gone a hop, skip, and a jump from Scotts Valley, via a winding, thick forested road, and had arrived at Skov Winery. Annette and David Hunt purchased Roudon-Smith Winery in 2003, but went their own way in December of 2010, forming Skov. They opened the tasting room March 19th; no wonder I'd never heard of them. Skov, pronounced Sko (the V is silent), is a Danish word meaning forest, reflecting Annette's heritage and the location of the winery. The tasting room was nicely decorated though a tad small, fitting 2 or 3 couples comfortably. Outside, the scenic grounds had plenty of room to sit and enjoy your tasting or even a picnic. Sahara, the winery dog, greeted everyone warmly, except for the occasional dog riding by in a truck, which she would run after barking and warn off. Families and dogs were equally welcomed. The interesting and entertaining Fred Reiss poured our tastes for us. He has authored three books, which were on the bar: Gidget Must Die, Surf.com, and Insult and Live!. Fred showed us the bottling line, explaining how everything worked. He threw out a French term, ullage, which is the unfilled space at the top of a bottle of wine; first time I'd heard that before. He continued his education, explaining that harvest was close and how wine makers would use refractometers to determine the percentage of sugar in a grape. Given our interest in wine, Fred recommended the book An Ideal Wine, which Bob had also recommended via a Washington Post review. He also recommended a couple of movies: MonteVino and Blood Into Wine. Fred's retelling of some of the scenes in MonteVino made the movie sound very interesting; we can't wait for this DVD to come in the mail. Blood Into Wine was available via NetFlix streaming and we enjoyed it that night. At some point during our tasting Annette came into the tasting room and enthusiastically greeted everyone. You could tell she loved what she was doing! She made her way around the room, trying to talk to everyone and making them feel welcome. While we tasted, a friendly couple from southern California, who were camping nearby, picked up a couple of bottles of the Chard for company that was due to arrive soon. The wine was very good. In addition to trying all the wines on the tasting menu we paid $5 for a glass of Merlot and Zinfandel to complete the sampling. Both were very interesting, in a good way, but probably could have used some time to breathe. 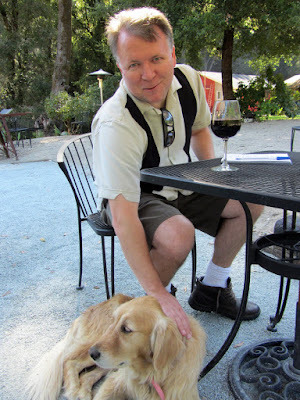 We picked up a bottle of the Pinot, even though I wasn't totally sold, but knew Ted would enjoy it, and the Zin, which begged to be tasted again. We headed home, getting the final score on the game: 40 to 7. Unfortunately, Skov has closed its doors.